Q. The small illustrations above were recently donated to the archives of the Center for Cartoon Studies at White River Junction, Vermont. CCS would like to identify the artist if possible. Student archivist Cole Closser writes: “Each illustration is in ink, drawn very small on Bristol board, cut to (usually) 7.5 x 6 inches.” When signed, the cartoonist used initials, followed by the year composed. 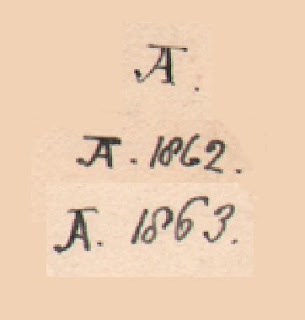 The initial seems to be an A but closer examination discloses a possible J as well, so it may read ‘A.’ or ‘J.A.’ The two samples here are dated 1862 and 1863. The illustrations would have been drawn as a guide for reproduction by wood-engraving and most likely intended for a comic periodical or boys’ story paper. Punch, begun July 17, 1841, was at the top of the comic pile but was the hardest for an aspiring cartoonist to break into. Often one of the towering mainstays had to die before a cartoonist would be summoned to the Punch offices. Mediocre artists were only occasionally made use of. The first issue of Punch’s rival Judy; or, the London Serio-comic Journal was not published until May 1, 1867. There was, however, one other paper which had a long life, although few of its cartoonists are remembered today, and that was Fun. It began on September 21, 1861 and lasted until 1900, second in longevity to Punch. At one time the entire run was available digitally but seems to have gotten lost in the memory hole. Google Books has the first volume available HERE. Another possibility is The Comic News, a short-life weekly penny paper edited by H.J. Byron which ran from July 18, 1863, to May 14, 1864. These periodicals were the most prominent comic journals of the early sixties but there were a dozen fly-by-night comics (the Arrow, The Comet, The Earwig &c., &c.) published by seat-of-the pants publishers floating round London at that time. When anyone has any suggestions or clues to the identity of the cartoonist we would greatly enjoy hearing about it in the Comments section. Thanks. Spielman's 1897 history of Punch has an appendix which is a 2-page list of Punch artist monograms going back to the beginning of the magazine, with accompanying I-D for all. Your ' J A' doesn't appear there. I presume the list is exhaustive though I haven't tested it.